Build server integration with NCover 3 meant adding a call to NCover Console to your build script with a task or exec telling NCover to profile your test runner and gather the coverage data. Now, the NCover Service monitors test runners without interfering with these processes at all. As our lead developer likes to put it, "NCover stays out of the way." The key to profiling any build with NCover is in profiling the right process. If you're running MSTest in your Sonar build, then you set up an NCover project to monitor qtagent. 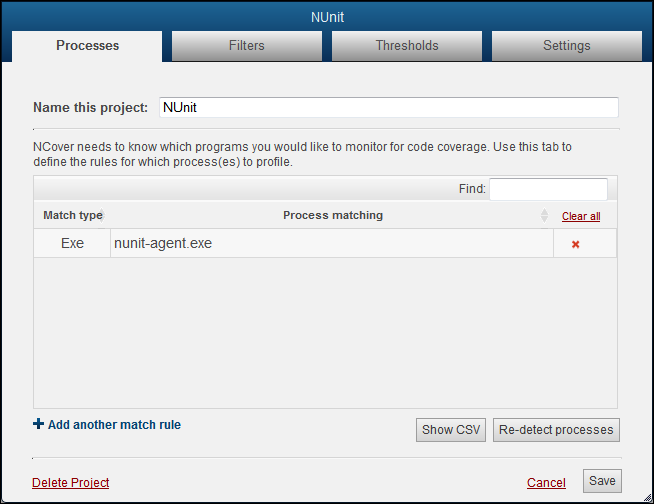 If you're running NUnit, you set up a project to monitor nunit-agent. The build platform isn't as important as the process that's running your unit tests. 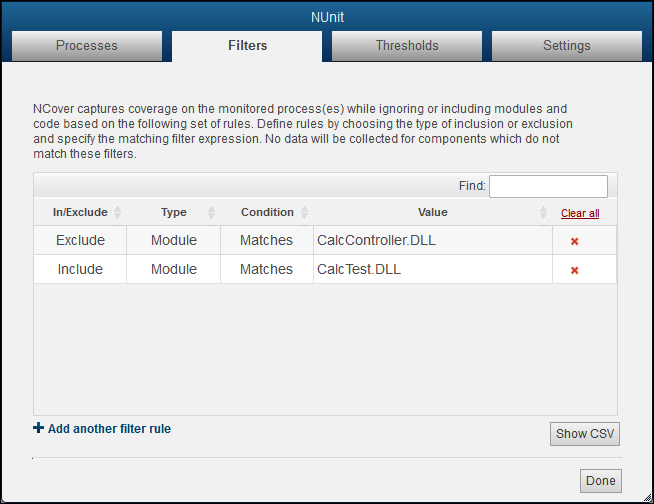 Before NCover can profile the integrated NUnit runner, you should modify the Team City environment. 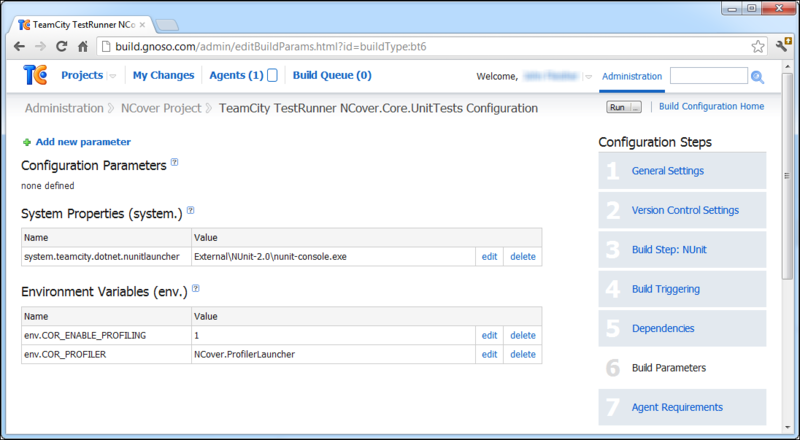 You can still run nunit-console from your build script if you prefer, but making some simple changes to the the TeamCity TestRunner config will allow NCover 4 to profile the integrated NUnit runner without changing your test process. 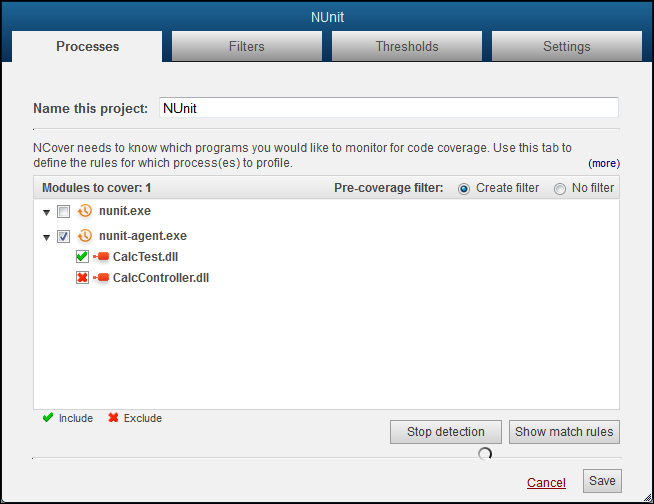 For NCover to detect the NUnit tests when they are executed by the build task, the build agent environment needs to be configured to enable NCover profiling. These changes will enable NCover to detect the TeamCity process that runs your unit tests. Depending on your test configuration, that exe will be some variation of "JetBrains.TeamCity.PlatformProcessRunner.v4.0.msil.exe". If your tests are designed for the v2 CLR, you'll need to watch for the v2 exe. Once you've modified the environment variables for the build as described above, you can create an NCover 4 project to collect your unit test coverage. 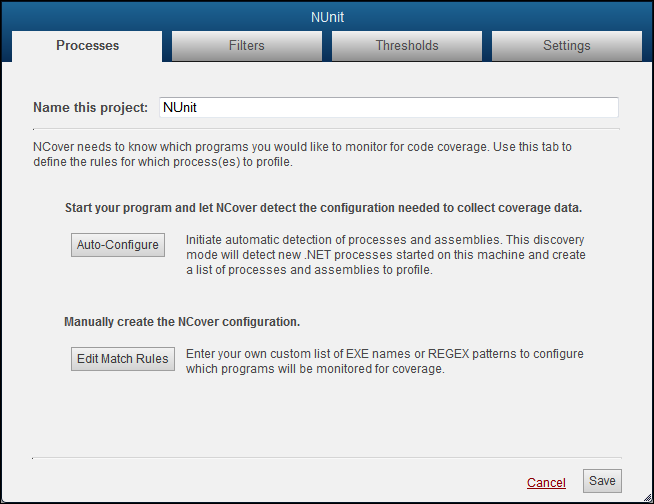 Note: If you're setting up coverage for a process running locally on the machine where Code Central is installed, you can let Auto-Configure see next step below) create project settings for you. If you're setting up a project for a remote Collector, then keep following these steps. From the "Processes" tab, name the project and then click on "Edit Match Rules" to specify the test runner you want to monitor. Let's say you want to monitor NUnit tests. Regex is a good choice in this case. The Regex option would be simply "nunit-agent", since the regex isn't case-sensitive. This regex pattern would match both "nunit-agent.exe","nunit-agent-x86.exe," etc. Once you've installed a Collector on your build server to profile your tests, connect it to Code Central and it will automatically pull down project settings from Code Central. 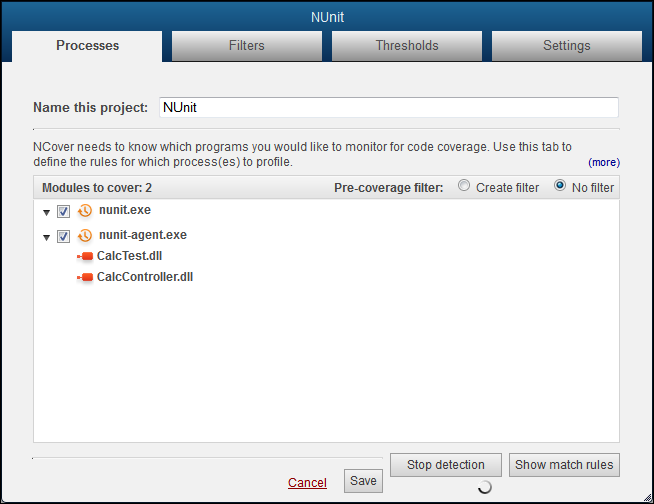 Since it's likely that you have more than one project on your build server that uses NUnit, having a Code Central project set up to simply monitor the Nunit agent would gather a confusing variety of data on unrelated projects. -- Collect coverage on the process specified in the command line. -- Write the coverage data to the specified project. -- Give each execution the specified build ID. 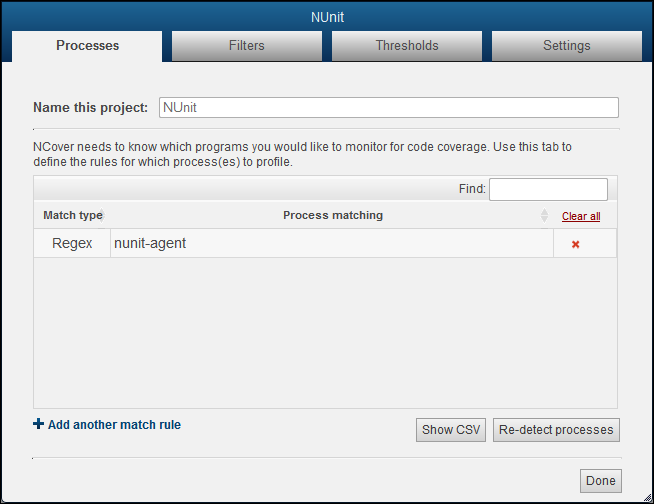 The next time the process -- in this example, NUnit -- you've defined in the Code Central project is run on a QA machine, developer's desktop, or a build server, Collector will automatically gather coverage and send it to Code Central, where you can view and analyze the coverage results.